Evolution Toy has revealed their upcoming 1/60 VF-2SS Valkyrie II at the Spring 2015 Miyazawa Models Exhibition.The VF-2SS was the primary mecha seen in Macross II: Lovers Again. This reveal comes as a surprise, as there haven’t been many VF-2SS’ made in any form. There’s only been a 1/100 plastic model kit, 1/250 gashapon and a couple garage kits made of the VF-2SS. 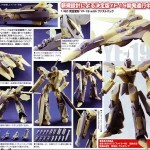 This will be the very 1st VF-2SS toy. 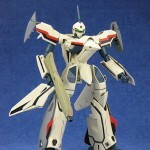 Evolution Toy plans to release their 1/60 VF-2SS in Autumn for 25,000 yen. Images from Dengeki Hobby are mirrored here, read on to check them out! 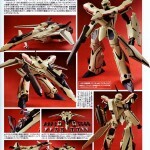 Type-R of our sister site TFW2005 has posted a new scan from the latest issue of Dengeki Hobby showing the resin prototype for the Arcadia 1/60 VF-0D. Something that stuck out right away is the use of diecast metal for the arms. Some of you may remember that Yamato’s VF-0A/S releases prior to the VF-0S Ghost bundle/2010 stand-alone re-releases were prone to arm breakages. 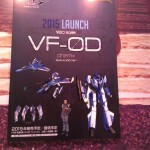 Arcadia’s VF-0D is due out next year, price remains to be determined. For Macross Zero fans, Shin’s VF-0D has been a long time coming, read on to check out the prototype! 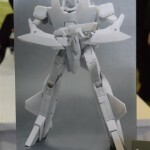 This past weekend at Winter Wonderfest in Japan, Arcadia officially announced their 1/60 VF-0D Phoenix Shin Kudo Version. Arcadia had posted subtle hints alluding to a forthcoming VF-0D toy a while back. It’s scheduled for release in 2015 but pricing has yet to be announced. Thanks to Tag Hobby for the CAD images, read on to check them out. Arcadia has released their official images for their upcoming 1/60 YF-19 with FAST Pack. This long awaited release aims to be the definitive YF-19 toy. Aside from the FAST pack, it comes with several missles shown in the VF Master Files VF-19 Excalibur book. The only things missing are the fold booster and arm missle launcher that Isamu used to take out a Monster Destroid practice target. Arcadia’s YF-19 with FAST Pack is scheduled for release in April 2014, just a few months shy of the 20th anniversary of Macross Plus. The list price is 34,440 yen. However, save some money by pre-ordering it from our site sponsor Hobbylink Japan, for 29,520 yen! The latest issue of Hobby Japan includes some new images of Arcadia’s 1/60 YF-19 in full color! The images show the full set of weaponry to be included with the release as well as the FAST packs. Also shown are the opening split canopy, and wings swept back in fighter mode for high-speed mode. No specific release date nor price have been announced yet. Due to the sheer amount of weaponry the YF-19 will come with, it will not be cheap. Thanks to Sup3rHobo of the 2005 boards for the heads up! Read on to check out the newest scan! 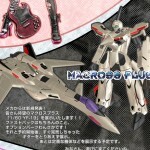 Arcadia has revealed their next upcoming Macross release, the 1/60 VF-1S Roy Focker Special Movie Version. Yamato released the VF-1S Roy Focker Special Movie Version numerous times in the past, with the last(Macross 30th anniversary version) released last year bundled with Option Parts(side covers for battroid mode, as well as exposed ejection seat also for battroid mode). This upcoming release by Arcadia includes the Option Parts bundled with a new display stand. This is also reflected in price as this price is the higher than previous releases(17,640 yen). Fortunately, our site sponsor Hobbylink Japan has a pre-order up for 15,120 yen! 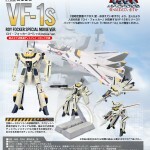 This is a great release for those of you who missed out on Yamato’s previous VF-1S Roy Focker Special offerings. Read on to check out the new images. These 2 releases are a testament to the popularity of Isamu Dyson. Thus far, no price or specific release date is listed for the YF-19, we just know it’s scheduled for release next year. 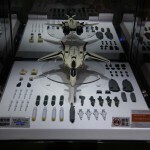 As for price, Mr. K(formerly of Yamato, now working with Arcadia) has hinted that the YF-19 and future Arcadia Macross offerings may feature higher price points. Given that the YF-19 to begin with will come with FAST packs and a generous amount of external missles, it is a possibility that this may exceed the 29,600 yen price point of Yamato’s VF-17D w/FAST packs set. Ever wonder what Arcadia has been cooking up for their upcoming 1/60 YF-19? According to some new scans(and alluded to from Arcadia’s Mr. K not too long ago), Arcadia will be including external missles for the YF-19! Previous YF-19 toys lack them. These missles may look familiar if you’ve perused the VF-19 Excalibur Master Files book. In addition, the missles have the ability to sweep back in fighter mode for high speed mode! The YF-19 was shown like this briefly during Isamu’s last dogfight with Guld in Macross Plus. Previously the only YF-19 product able to replicate this was the 1/144 diecast model by Doyusha! Thanks to Renato of MacrossWorld for the scans and heads up! Arcadia has updated their WonderFest 2013 page(NSFW) with a new color CAD image of their upcoming 1/60 YF-19 from Macross Plus. The prototype will be revealed at WonderFest this Summer! It differs drastically from previous YF-19 toys by Yamato. Gone are the legs which were too slender/long, in is the much more accurate, bigger, more heroic, silhouette! Stay tuned as Summer WonderFest 2013 starts July 28th!